« Longest Zipline In U.S. Used For Local Commute In Maine. Today should have been a very bad day. It was one of those sunny New England fall days when you just have to get outside. Since my house is shaded, I had no leaves to rake. So it was time to get the bikes out for a ride. Unfortunately, I hadn’t fixed the bikes. But I had purchased what I needed. I had a new valve for the back tire of my son’s bike, and I had a doo-hickey to help me shorten the chain on my bike so it doesn’t come unglued every time I go uphill (nothing quite like a chain losing its cool and jumping the tracks when you’re half way up a long hill). So, feeling smug, I took out my equipment and started. After all, I have an advanced degree and got a fairly high score on my SATs back when they were the “real” SATs. So I should be able to master a few gears. First problem. My son’s valve doesn’t just not work. It has broken into bits. Bits that I proceed to jam down into the tire with a tiny screw driver. So I do what any man would do. I move on, leaving the first project unfinished. 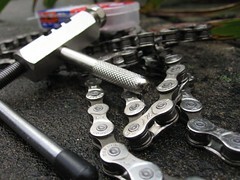 Anyone who has tried to shorten a chain will appreciate the following. Anyone who has not tried to shorten a chain should run screaming from the prospect. If necessary, purchase a new bicycle before engaging in this particularly brutal form of masochism. An hour later, I was no closer. But I’d just been reading Dale Carnegie, so I had that “can do until I’m dead” attitude. Didn’t help much. I can only describe the following in miraculous terms. I hit upon the idea of using one bit of chain to “channel” the bit of steel I needed into the chain I was now trying to repair. It worked beautifully. How that idea came to me after an hour of jiggering, I’ll never know. Looking back at my first unfinished project, I hit upon the idea of simply pumping up the tire, letting the bits of the first valve hold in the air. It worked. I have no logical explanation. So we got our afternoon bike ride. Not really any thanks to me. Maybe we all look for “major” miracles in our daily lives, when it is really the minor miracles that matter. This entry was posted on September 23, 2012, 6:04 pm and is filed under Humor, Miracles. You can follow any responses to this entry through RSS 2.0. You can leave a response, or trackback from your own site. bottom line, you went out riding! Yes, and it was a truly great day. It just didn’t seem possible for the two hours I spent beating away at the tire and the chain. Bottom line for me is that you recognize the amazing moments in your everyday life. If more did, we’d all be better off. I didn’t read anything about how fun the ride was. That you were able to fix the bikes is what you wrote about. Small victories. Where does inspiration and ideas come from?